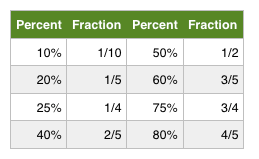 Now that we have already studied fractions and decimals, we discuss percentage. You are likely to be aware that the concept of percentage is very useful in daily life. We always go to stores where there are discounts and we do not want loans with high interest. These calculations involve the concept of percentage. Percentage is a number ratio expressed as a fraction of 100. When we say 10 percent, what we really mean is 10 out of 100, or in fraction notation 10/100. Therefore, when we see that a shirt is sold for a 50 percent discount, we actually say 50 out of 100 or 50/100. Notice that 50/100 when reduced to lowest terms is 1/2 which means that we only have to pay half of the price of the shirt. As we all know, we use the symbol % to denote percent. Percents, fractions, and decimals can be converted to one another, to whichever representation is more convenient for calculations. In examinations such as the Civil Service Exam, in most cases, fraction is the easiest to use but the problem is conversion also takes time. Therefore, it is also good to familiarize yourself with the conversion of the most commonly used fractions in problems such as shown in the table below. You can memorize them if you want, but the conversion method is fairly easy that you can do them mentally. In the next few post, will discuss how to convert fractions, percents, and decimals to one another. Then, we will also discuss common percentage problems like discounts and interests. These types of problems usually appear in the Math Word Problem Solving section of the Civil Service Examination.